The sun is out once again – the worst of the southwest monsoon disaster is over. Although most Filipinos are returning to their everyday routines, some are still seeking for normalcy, like me. Despite being safe and dry in my room, most houses, alleys and streets in Pasig are still submerged. Usually we wait for weeks to see the concrete roads again. Do we have to keep up with this every time a strong typhoon – or in this case, monsoon – comes our way? Paulo Alcazaren, Editor-in-Chief of BluPrint Magazine says it best. 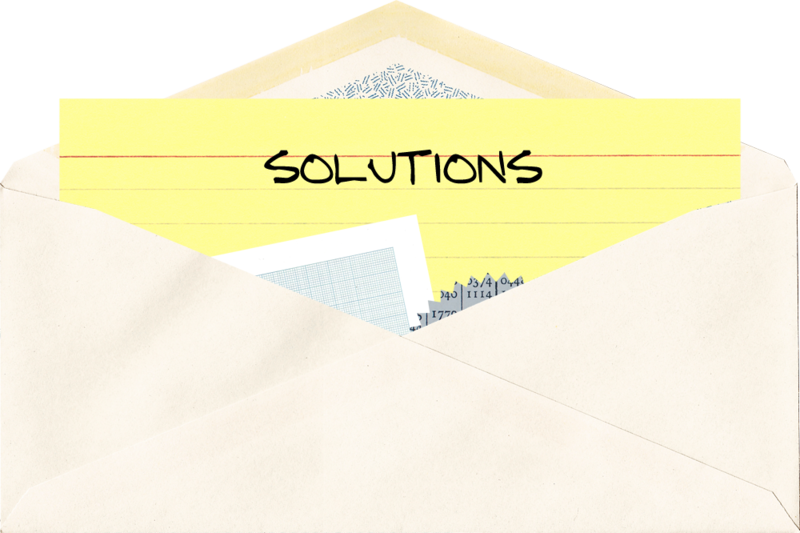 Not only does he address the need for change, he gives us reasons and solutions with his quick sketches. We cannot stop these natural phenomena – it will always rain and every year it will rain harder. So what do we do? Be educated. 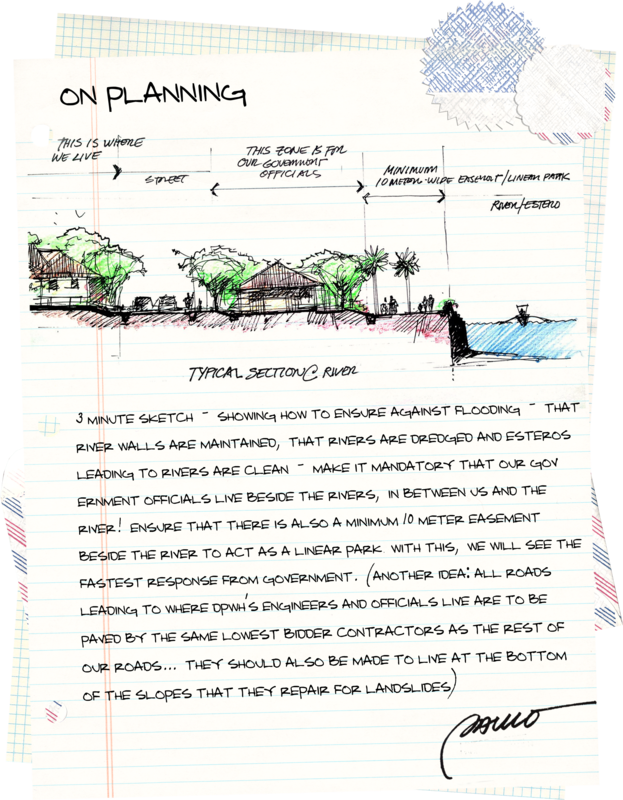 The massive flooding in the Metro and all parts of the Philippines is not only due to our very poor waste management – it is all about the planning, too. 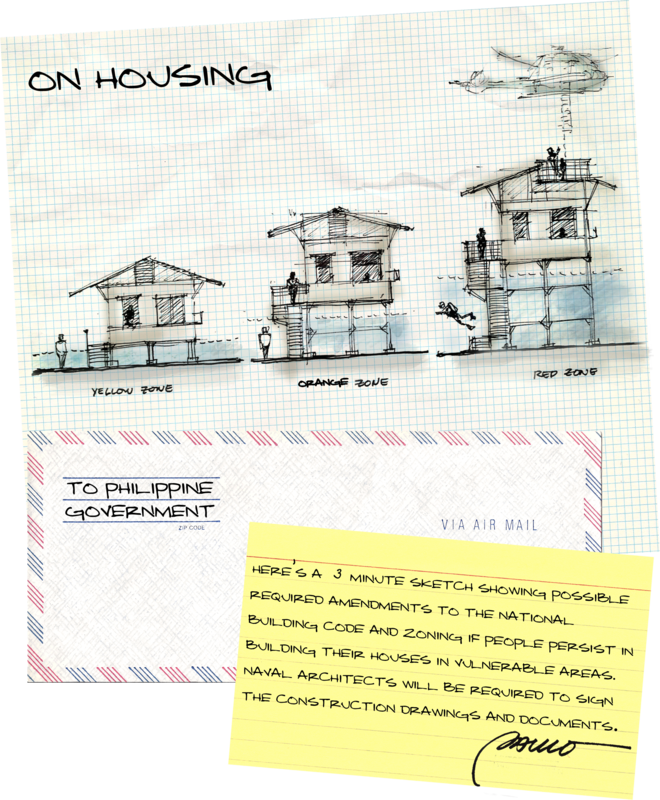 The Urban Planning of the our cities must be reviewed, the designs of our houses must be reconsidered. Architects must design with the elements, not against it. And I hope, with all my heart, the Government will help. **Paulo Alcazaren, Principal of PGAA Creative Design-Site Planning, Urban Design and Landscape Architecture, Director of PDAA Pte Ltd, Singapore, Editor in Chief of BluPrint Magazine, Columnist of ‘City Sense’- Philippine Star, UP Architecture Alumni. Check out his Facebook for more of his quick sketches. This entry was posted on August 11, 2012 by Maricar de Dios. 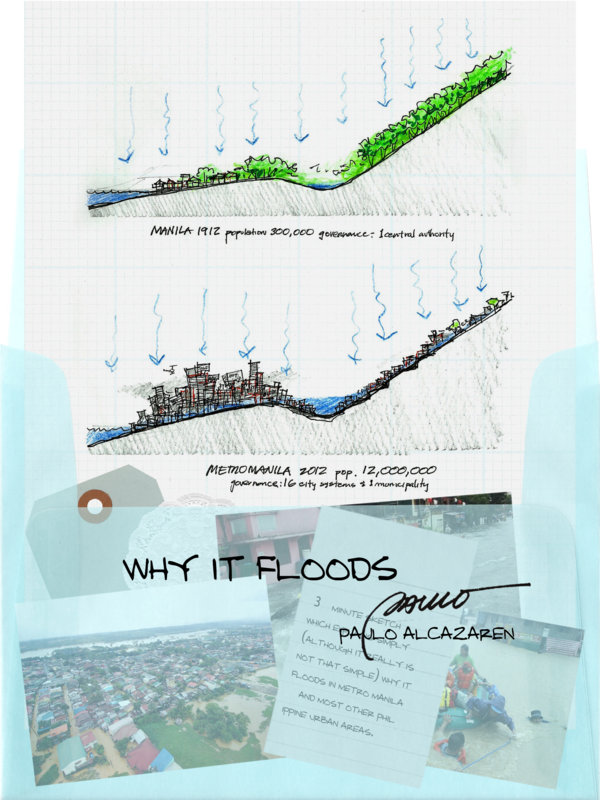 It was filed under Architecture and was tagged with Flood, Flood Solutions, Metro Manila, Paulo Alcazaren, Philippines, Sketches, Urban planning.